Thinking about joining ICHP as a technician member? Check out our member benefits and sign up today! All Illinois Pharmacy Technicians please take note that Illinois is moving to an ONLINE ONLY licensure process beginning September 1, 2017. All paper applications and payments postmarked before September 1st will be accepted and processed. Those postmarked on or after September 1st for impacted professions will be returned to the sender. This deadline applies to the Pharmacy Technician profession among others according to the press release from the Illinois Department of Financial and Professional Regulation (IDFPR). Congratulations to the winner of the national technician CPE survey! Online version is free to ICHP Technician members! 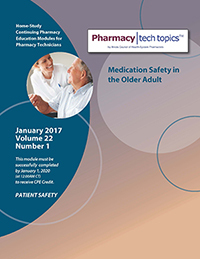 ICHP pharmacy technician members are automatically signed up for an online subscription to Pharmacy Tech Topics™ as part of their ICHP membership and receive an email with access information from the pharmacytechtopics.com website. If you need assistance accessing your online subscription, please call us at 815-227-9292. Pharmacy Tech Topics™ is home study continuing education for pharmacy technicians by Illinois Council of Health-System Pharmacists. Our modules are authored by leading pharmacy experts in their field, and address the latest disease management and operational issues. Modules are published quarterly in January, April, July and October. A two year Pharmacy Tech Topics™ subscription fulfills all of PTCB’s recertification requirements (twenty contact hours, including law and patient safety credit)! Two options available: online and paper modules by mail! For more information, please visit www.pharmacytechtopics.com. Champion Home Study available to ICHP Technician members! To learn more about free ICHP Champion webinars, recorded live, and available as home study on CESally.com, please check out the Champion webinar page. This is a reminder that effective January 1, 2016, PTCB implemented a change in continuing education (CE) recertification requirements for CPhTs that reduces the allowable number of CE hours earned via college/university courses from 15 to 10. Beginning in 2016, a maximum of 10 of your 20 CE hours may be earned by completing a relevant college course with a grade of 'C' or better. In addition, in-service hours are no long accepted for CE credit in recertification as of January 1, 2018. Read more. The CPE Monitor is a national, collaborative effort by the National Association of Boards of Pharmacy (NABP) and the Accreditation Council for Pharmacy Education that allows pharmacists and pharmacy technicians to track their completed CPE credits in a central system. PTCB is completing the first step in the process of connecting information in your CPE Monitor account to your PTCB Account. In the future, this connection is designed to allow CE hours entered into your CPE Monitor account to simultaneously be recorded in your PTCB Account. Part of this process involves you, as a CPhT. It is important that you log into your CPE Monitor account to be sure your NABP e-Profile is set up correctly, and then check to be sure your PTCB Certification number is reflected. All pharmacy technicians are encouraged to register for CPE Monitor if they have not already done so. 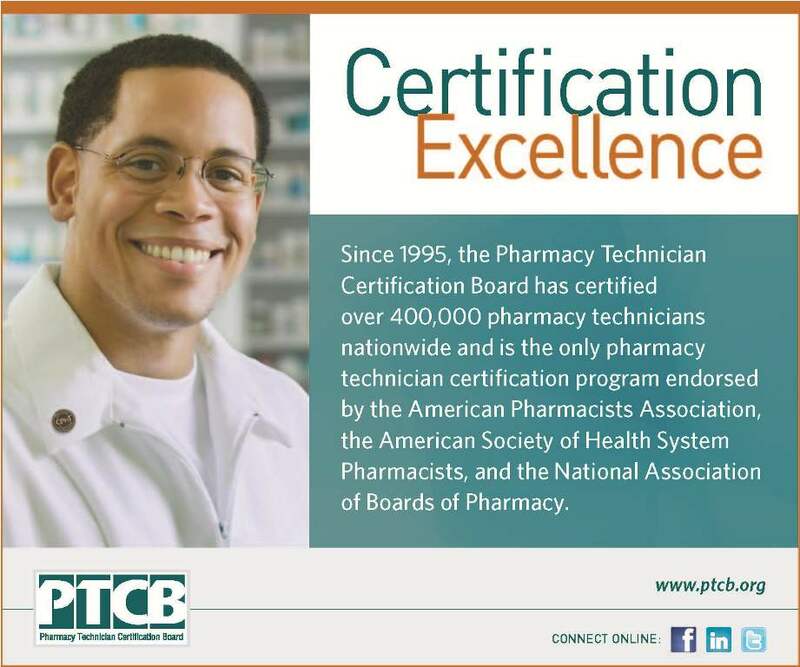 Beginning in 2020, PTCB will require candidates for initial certification to complete a pharmacy technician education program accredited jointly by the American Society of Health-System Pharmacists (ASHP) and the Accreditation Council for Pharmacy Education (ACPE). Read more. PTCB requires CPhTs to submit 20 hours of pharmacy technician-specific (‘T-specific’) continuing education (CE) to qualify for recertification. In addition, as of 2018, PTCB allows 5 hours of in-service training, however, no in-service training will qualify for CE. Additional new requirements, taking effect January 1, 2020, are part of the program changes announced by PTCB to advance pharmacy technician qualifications by elevating PTCB’s standards for certification and recertification. Continuing education and information for pharmacy technicians. A new resource for pharmacy technicians and those individuals who want to become one! Visit this exciting website to learn all you can about the career of pharmacy technician. Training, education, certification, frequently asked questions and much more. PharmTechInfoCenter.com will get you started or keep you moving up the career ladder! Need help recertifying online? Check out PTCB's Recertification FAQ Page for step-by-step help at www.ptcb.org! ASHP's Pharmacy Technician Certification: Review & Practice Exam, 3rd Edition is now available! 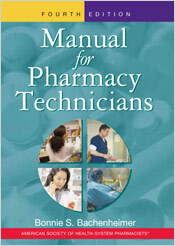 ASHP's Manual for Pharmacy Technicians 4th edition is now available! The trusted training resource for pharmacy technicians at all levels. Complete your library of resources for pharmacy technicians. ASHP has introduced the brand new companion Workbook for Understanding Pharmacology for Pharmacy Technicians.